Welcome Back! The Tinderbox is the first Danish animated movie. It was released in 1946. The director was Svend Methling and the studio was Dansk Farve- og Tegnefilm. The Tinderbox doesn’t even have a Wikipedia page, and on the IMDB page it calls the movie “Magic Lighter.” The Magic Lighter has the same director, same year, same studio, same everything. There isn’t any information on this movies, besides the cast. 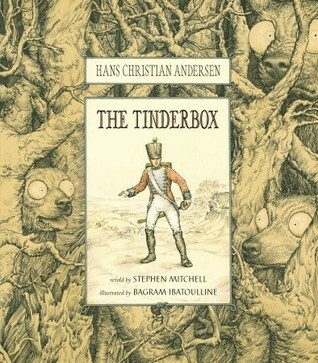 The Tinderbox is a fairy tale by Hans Christian Anderson. The author who is famous for many fairy tales including, The Little Mermaid, Thumbelina, The Ugly Duckling, The Snow Queen, and many more. While, I’ve never read the original story; I do know that Hans is a wonderful author. I don’t know how similar the movie is to the story though. So, this film has basically no information about it. It was really hard to find the movie, but here it is. (Well, at least I hope this is the movie anyways.) The movie is in Danish, and there are no English subtitles either. The music reminds me of a mix between Cinderella and Bambi. The characters are beautifully created. You can tell the difference between the characters. The animation is quite beautiful. While, I am not sure if it is a language barrier or if the movie didn’t explain it well, but I’m not understand the story. Maybe, I should say the point of the story. The plot is basically the Princess and the soldier love each other, but they can’t be with each other. I don’t understand why they can’t be with each other though. Then in the end, they are allowed to be together. Is the only reason they’re allowed to be together is because; they were “threatened.” Again, maybe this was answered in the movie, and it’s just a language barrier. I’m not really sure. The characters don’t seem to have any independent characteristics. You can tell who is who, but that’s it. There isn’t any actual “character” in them. Also, there aren’t any villains, or really any conflict. Most of the movie, I was bored and confused. Next, up is a Disney classic, Make Mine Music. Make Mine Music was released in 1946. It is the third package film, and is similar to Fantasia. It is the first American animated film to be made after World War 2. I’ve seen it, but it was a long time ago. So, I don’t really remember much of what happened. (I do not own pictures, videos, etc. My information came from IMDB). Yeah, well, the story is kind of creepy with the Soldier constantly visiting / kidnapping the princess. I thought that at first. I was like did he really just kiss this lady, But, then she kissed him back and they got married. So, I thought she was ok with it lol. I admire you for watching a movie you don’t know the language of without subtitles.